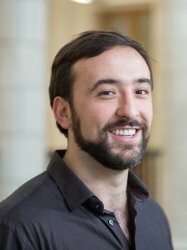 Dr. Stefano Angioletti-Uberti obtained his PhD in Materials Science at Imperial College London in 2010, working on modelling of solid-liquid interfaces in metallic alloys. After that, he moved to the University of Cambridge in the group of Prof. Daan Frenkel, shifting his research to Soft Matter. In 2013, he was awarded a prestigious Alexander von Humboldt Research Fellowship and moved to the Humboldt University of Berlin (Germany), where he continued his work on functionalized nanoparticles and surfaces with Prof. Joachim Dzubiella and Prof. Matthias Ballauff. In September 2015 he moved to Beijing University of Chemical Technology as Professor of Soft Matter, where he still holds a position as Adjunct Professor and PI in the Beijing Advanced Centre for Soft Matter Science and Engineering. Since October 2016, he is now a Lecturer at Imperial College London, where he continues his research on theory and modelling of Soft Matter systems, with an emphasis on controlling materials behaviour via functionalization with ligands of biological and synthetic origin.